So last time I gave a bit of background to Folksy and Etsy and talked about some of the things that can and can't be sold on each site. This time I'm going to concentrate on the differences (and similarities) between the sites in terms of actually putting items up for sale; including listing, renewing or relisting items, and ease of setting postage rates. Enjoy! Note I have updated this post 18th September 2012 - there were LOTS of changes to both sites over Summer 2012 when it comes to listing! Folksy - One listing is for one item and costs 15p (excluding VAT, so 18p with 20% VAT). You can list a quantity of up to 100, but each quantity costs 15p+VAT, so 5 items will cost 75p+VAT. The listing lasts 4 months (actually 120 days, to be precise). For sellers with the Folksy Plus account (which costs £30 per year), listing is free. I list a quantity of 4 Bumblebee cat collars. At that time, 20c is added to my Etsy bill. Someone buys one collar. At that time, no listing fee is added to my Etsy bill, just the selling fee. Someone buys two collars. At that time, two listing fees - so 40c - is added to my Etsy bill, as well as the selling fees. The listing still has one collar available to buy, but the 4 months runs out before it sells. So I never pay a listing fee for this last collar. The bonus is that you can add quantity at any time. So after selling the two collars at once, I could have increased the quantity from 1 to 3 without paying any further listing fee at that time. It's really easy to update listing quantities now too. The only time you pay a new 20c fee is when you list a brand new item, or are renewing a previous expired listing. Additionally, whenever someone buys a quantity of your item, if there is quantity left, the expiry date on the listing extends to the full 4 months AND the item behaves like a "new" item, moving to the front of your shop and also helping with Etsy search, especially if browsers sort search results by recency. Although not technically related to "listing", I think here is a good place to mention the selling fees on both sites too: on Folksy it is 6% of the cost (5%+VAT), on Etsy 3.5%. Many crafters make one off items and the ability to have multiple quantities on a single listing isn't of interest to them. Etsy and Folksy are now not so different for these crafters - Folksy is marginally more expensive at18p, Etsy costs 20c which is roughly 13p. The selling fees are higher at Folksy as well. If your craft allows you to make multiples of the same item (like mine does), then lucky you! 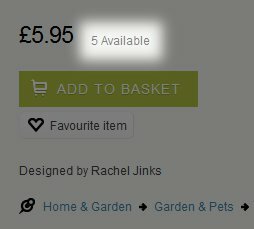 Etsy is SO more convenient than it used to be now that you can list quantities without paying the listing fees upfront. I really believe this change in Summer 2012 has transformed my Etsy shop, as previously I just didn't want to pay that 20c when I wasn't even sure the item would sell. I'd always list collars with quantity =1, and risk losing impulse customers who wanted multiples of the same style. The introduction of the Folksy Plus account has revolutionised that shop for me too! A payment of £30 and all listings are free for a year. Instead of just having 8 or 10 collars in my Folksy shop, I have now got almost my full range in there, which makes my shop look much more attractive. Even aside from the potential cost savings, batch making is a great way to increase your efficiency, as making things in small batches usually saves time versus making them all separately. It also means that you only have to do one photography session to potentially sell those five items. Both Etsy and Folksy use a one page listing system now, so there's not much between them in this respect. I slightly prefer Etsy as you can see your photos (as thumbnails) immediately after you upload them and rearrange them if you wish. 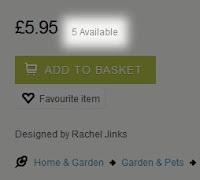 On Folksy you have to click through to the preview page to see them. Listing on Folksy used to be rather slow, but now they have made some changes (September 2012) and it's much much better. Folksy - Woohoo! Folksy brought in everlasting URLs in 2012, so when you renew an item, it keeps the same URL. Etsy - You can relist the same listing (they call it renewing) – and you keep the same URL, assuming you click the "renew" button on the sold or expired listing, not the "copy" button. Well, when I first wrote these guides, Etsy won hands down if you make the same or similar items, as Folksy used to give you a different URL when you re-listed an item after it sold out. It made it really hard to keep products at the top of Google searches and every time you re-listed, all the old links would point to a sold-out item. However, this is no more. When you relist an item now, the URL stays the same, and so there isn't anything to choose between Folksy and Etsy on this point! It's important that a product URL will go on and on and on, because you can keep promoting the same items and seeing the rewards - in terms of Google placement - build up. It also means that you keep your item views as you renew them each time - so you may end up having an item that was listed yesterday but already has 1000 views (because you’ve been renewing it every fortnight for the past 6 months). Folksy - has grouped countries together into areas, but still no ability to save postage costs in a shipping profile. Etsy - uses shipping profiles, which mean you can set a profile and apply it to all listings when you create them. You can also group countries together into "shipping areas"
Etsy uses shipping profiles, which are saved in your shop information, rather than in each listing. This means you can set a profile (or multiple profiles) and then when you make a new listing, all your profiles are available to select in a dropdown menu. This is a real timesaver if you have fixed shipping tariffs like I do. Folksy doesn't have this ability, and so in theory you must set all your postage details in each new listing that you make. However in practice it's easier - if you make a new listing by using the "list similar" button on an existing listing (in your seller Dashboard), the shipping information in that listing is preserved so you don't need to enter it again. Another advantage with Etsy is that it allows you to group countries together into shipping areas, which means for example that you don't need to include every European country separately, but can group them together into one postal area. This is a real boon for UK sellers, since Royal Mail divides its charges according to whether you want to send something within the UK, within Europe, or to the Rest of the World. You don't want to go having to set postage individually for Albania, Andorra, etcetera do you? One slightly annoying behaviour in Etsy which I will flag up here is that if you change a shipping profile it won’t automatically update in your listings too. However you don't have to go into each listing to re-apply it, there's a clever tool that lets you apply shipping profiles to multiple items at once. Next in the series... How the two sites vary when it comes to getting your shop to look as you want it to, and other aspects of day-to-day running of your shops. OOO thank you very clear! Have followed you now. Very interesting - thanks very much! Thanks for all this info. Very clear and concise and quite easy to follow. I sell on both sites and although I knew the differences deep down, this has confirmed and sort of crystalised them for me. I think you have done an excellent job of comparing both sites. I just wish other people remember how small Folksy is compared to Etsy. I think Folksy does a great job and I like the friendliness of it and the fact that I am helping to promote UK sellers.